I hope you all had a wonderful long weekend. Maybe that time off has you back thinking about what projects you have coming up. Anybody moving? Renovating? Sprucing up an old bedroom? Well I’ve got money saving tips for you & a coupon code to order your very own paint for less! As some of you may or may not know, I am and have been Mythic Paint‘s brand ambassador for some time now! I love that they worked with me and my passions (travel, design, color) to create a special collection of paints! Here are the colors swatches, aren’t they beautiful? My favorite part about being able to customize these colors is that they evoke memories from when I’ve traveled to let’s say the Caribbean or Barcelona. The blue hues are so wonderful and can be toned down or brightened up depending on the furniture and accent colors you are using in your rooms. Same goes for the neutrals! One of my favorites is Cathy’s Optimism. 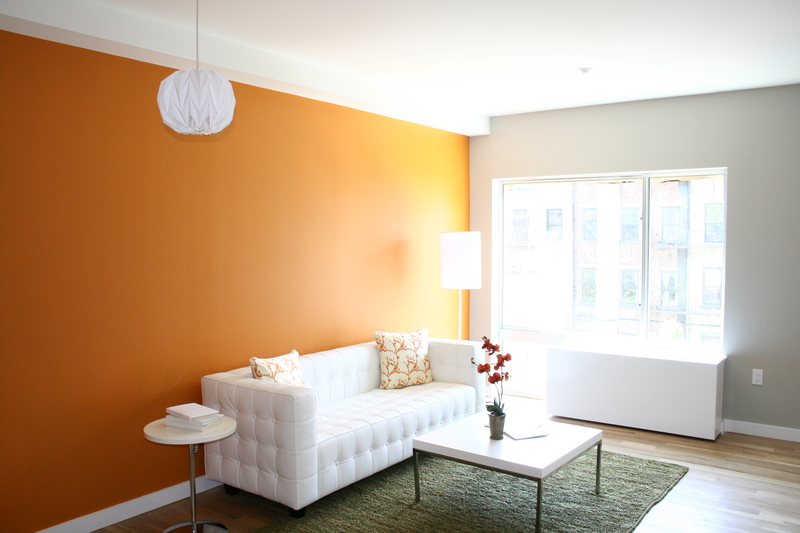 Having trouble styling an orange room? Check back for Wednesday when I dive into #HomeStagingSecrets! I’ll give you tons of tips and tricks on how to make a bold color pop but not freak you (or your guests) out! Mythic paint is my favorite because it is toxin-free. They even have a Paint Calculator on their website so you can tally up how much paint you’ll actually need. This means no paint goes unused! Perfect money saving tip. Now for the good part.. Coupon Code! 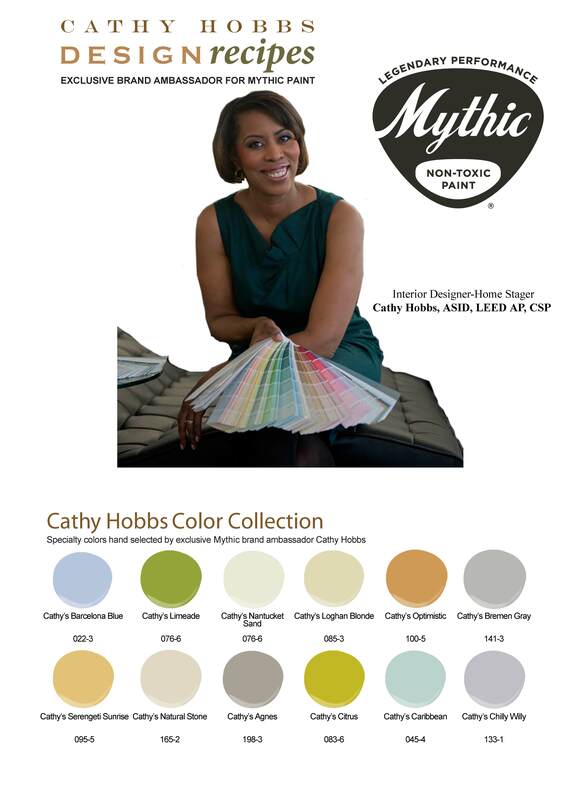 Mythic Paint Signs Interior Designer Cathy Hobbs As New Exclusive Brand Ambassador Releases Cathy Hobbs Design Recipes Paint Collection! 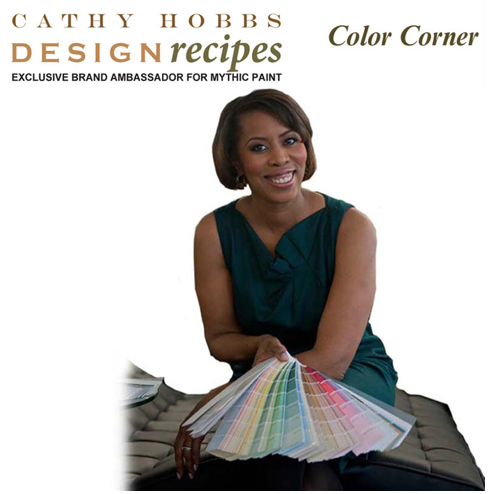 ≈ Comments Off on Mythic Paint Signs Interior Designer Cathy Hobbs As New Exclusive Brand Ambassador Releases Cathy Hobbs Design Recipes Paint Collection! HATTIESBURG, Miss. (September 19, 2012) – Mythic Paint, the world’s first zero-volatile organic compounds (VOC), zero-toxins and non-carcinogenic high performance paint, announced today that Interior Designer Cathy Hobbs (ASID/LEED AP), founder and creator of Cathy Hobbs Design Recipes™ has been named as its new exclusive brand ambassador. Cathy is a nationally known interior designer and five-time Emmy Award-winning television personality and will be promoting the high performance, non-toxic paint. 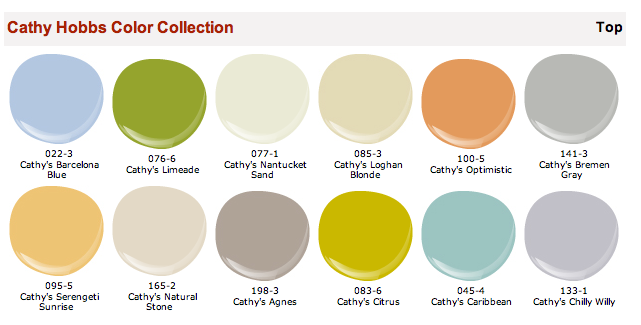 Cathy’s new color collection, Cathy Hobbs Design Recipes, contains 12 specialty colors hand selected by Cathy Hobbs. “Cathy is the perfect choice to speak directly about Mythic’s superior colors and the premium performance properties,” said Keir Kleinknecht, president of Mythic Paint. “As a nationally recognized interior designer specializing in sustainable design it’s a perfect fit for Mythic!” “I am absolutely thrilled to be associated with Mythic and premiere my first paint collection with such a well respected national brand”, added Hobbs. Cathy was a finalist on Season 6 of HGTV’s Hit Reality Series “DESIGN STAR” and has been featured on national programs like “The Nate Berkus Show”, “HGTV’s Top Ten”, “Martha Stewart Living-Radio” and is currently a regular contributor to the prominent shelter sites Sheknows.com, Shoptopia, CottonCandy Magazine, and ehow where she is a presenter hosting her own interior design web series. 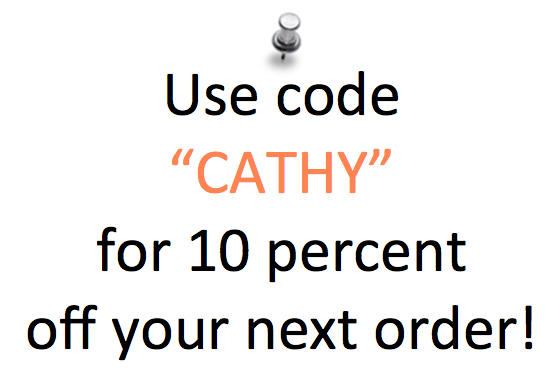 Cathy is also the exclusive design columnist for The Epoch Times, an international newspaper. Cathy is the founder of Cathy Hobbs Design Recipes (www.cathyhobbs.com ) which is a boutique style full-service design firm, which executes high-end residential and commercial interiors while also specializing in affordable design solutions called Design Recipes, as well as home staging. Cathy is a LEED AP, recognized and credentialed by The U.S. Green Building Council for her exceptional expertise and knowledge of Green and Sustainable design and is the only Green Home Stager in New York City. She is also an NCIDQ certificate holder. A graduate of one of the top interior design programs in the country, The Fashion Institute of Technology, her commitment and vision is to make interior design approachable and affordable to all those who seek the services of a professional designer. 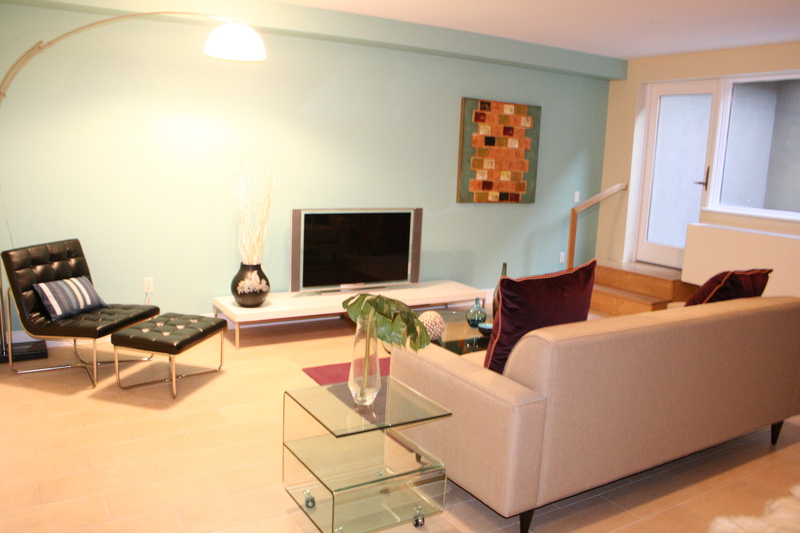 Cathy is a professional member of the American Society of Interior Designers and the International Interior Design Association, as well as a certified staging professional. Credentialed by Certified Staging Professionals (CSP), Cathy is also one of the top home staging trainers in the country, traveling nationwide teaching real estate staging for CSP to aspiring stagers. Southern Mississippi is a revolutionary way to make paint. Instead of taking out the VOC containing solvents as many other paint companies do, Mythic Paint is created without ever using them in the first place. 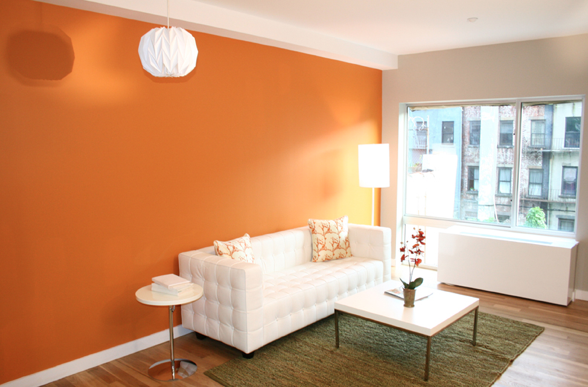 The result is a highly durable paint that outperforms all others in industry standard scrub tests, and yet contains no VOCs or toxins. It is available in eight finishes for interior and exterior uses, and comes in an unlimited color choice and a designer palette of over 1,200 hues. “Cathy’s knowledge in sustainable design coupled with our products will result in a positive future for her clients and our planet. Mythic also allows her to create her signature “Global” designs using our legendary paint.” said Keir. Mythic Paint, a subsidiary of Southern Diversified Products (SDP) was developed in cooperation with the University of Southern Mississippi. The guaranteed high-performance paint is available in a 1,232-color palette and can also be matched to any competitors color using a zero-VOC coloring system. It is available in multiple sheens for interior and exterior use. Mythic is available in independent paint stores nationwide. To find a retailer or for additional information, please visit the Mythic website at www.mythicpaint.com or call the customer service hotline at 1-888-714-9422.